Mesothelioma is a very serious disease and, as if this isn’t bad enough, the various treatments for mesothelioma can also be very difficult. As a result, anyone with mesothelioma needs assistance and comfort from family members, friends, professionals, support groups and members of the community. 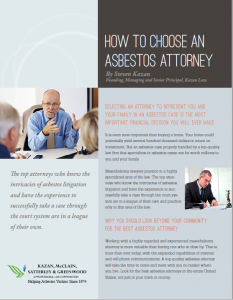 Mesothelioma help personal planning is a vital piece of Kazan Law’s role in helping you and your family through this complicated process. It is often helpful to seek the support of a group or organization devoted to the needs of cancer patients and victims of other devastating illnesses. Talk to your doctor about this. Kazan Law can also provide you with a list of organizations that might be of assistance. Most of us find it unpleasant to contemplate our needs and the needs of our family during a critical illness, but this is something that all of us have to do at some point in our lives. At Kazan Law, we have found that those clients who make preparations are better able to ease the burden on themselves and their loved ones if things get worse. Arranging for a Durable Power of Attorney for health care and financial management decisions is often invaluable because it eases a lot of stress during a difficult time. Estate planning is also something to consider. It is a good idea for almost everyone to have a will or trust, but it is increasingly important as you get older, if your health deteriorates, or if you have a family. If you have a will or trust it might be useful to review it to make sure it expresses your desires at this time. If you have a trust, it is necessary to make sure that all assets you wish to include in the trust have been assigned to it. For example, if you pursue a lawsuit related to your illness, and you want recoveries from that lawsuit to become part of your trust, you must formally assign the lawsuits’ proceeds to the trust. If you do not have a will or trust, you might want to consider drawing one up. This can best be done by an attorney who specializes in wills and trusts. Two good ways to find one of these attorneys are to ask your friends for recommendations, or to call your county or state Bar Association lawyer referral service.